Is Fast Food Addictive? | Is Fast Food The New Painkiller? Is Fast Food The New Painkiller? This entry was posted in Mental Health and tagged Diabetes, Eating Disorder, Food Addiction on May 2, 2016 by Team Addiction Hope. When you hear people speak about addiction, the first things that come to mind are usually drugs like cocaine, heroin, alcohol and maybe even nicotine. Research, however, is beginning to show that many of the ingredients found it fast food can produce a similar addictive effect on the brain. Burgers, fried chicken, milkshakes, french fries and soft drinks are loaded with processed carbohydrates and unhealthy fats, both of which can trigger the release of the same feel-good chemicals as hard drugs. The compulsive urge to eat these foods can no longer be chalked up to a simple lack of willpower, but can it really be called addiction? Is Fast Food Physically Addictive? A study carried by the Scripps Research Institute was able to show that the kinds of high-fat, high-sugar meals served at fast food restaurants have a similar effect on the brain as cocaine and heroin, in rats at least. The researchers were able to demonstrate that the reward and pleasure centers of the rats’ brains were highly overstimulated when consistently fed a diet similar to fast food. This same over-stimulation is also found in the brains of drug addicts. The Scripps research team concluded that fast food can trigger addiction-like neuroadaptive changes in the brain, leading to compulsive overeating. After eating a fast food meal, patrons are hit with a wave of feel-good chemicals. After a short while, however, their insulin levels drop, along with their mood. They’ll soon crave more of the highly satisfying foods in an attempt to recapture the high, and often won’t feel satisfied until they do. There is another aspect of fast food that can lead to addictive behavior, and it has nothing to do with the food itself: convenience. Countless Americans are routinely eating at fast-food restaurants primarily due to convenience, price and highly targeted marketing. The same way a drug addict will struggle to achieve recovery when surrounded by friends and family who continue to abuse drugs, fast food patrons are tempted at every turn to pull into the drive-through lane and pick up a quick and easy meal. There are a number of reasons why people find themselves addicted to fast food, but it’s important to realize that quitting this unhealthy habit is possible at any time. Here are few guidelines you can follow to move toward a healthier way of eating. It’s important to better understand what triggers your cravings for fast food. Is it when you are pressed for time in the morning before work? Do you turn to fast food when you are dealing with emotional stress or sadness? Once you understand your fast food habit more completely, you can being to make the necessary lifestyle changes. If it’s the convenience of fast food that keeps you coming back for more, consider preparing your own meals in bulk at the beginning of the week. A healthy veggie frittata can be made in under an hour, and will provide you with a week’s worth of breakfasts. It might take a little more planning, but by staying well-stocked with healthy meals and snacks, you can eliminate one of the primary excuses for indulging in fast food. It’s easy to lose track of how often you eat at fast food restaurants. But by keeping a detailed log of exactly what you eat daily, you can better understand your own eating habits. As is the case with many addictions, people often fall back into their compulsive behaviors out of habit, and don’t even realize what they’re doing. Often, all it takes is a simple action like snapping a cellphone picture of each meal you’re about to eat to feel accountable for your behavior. 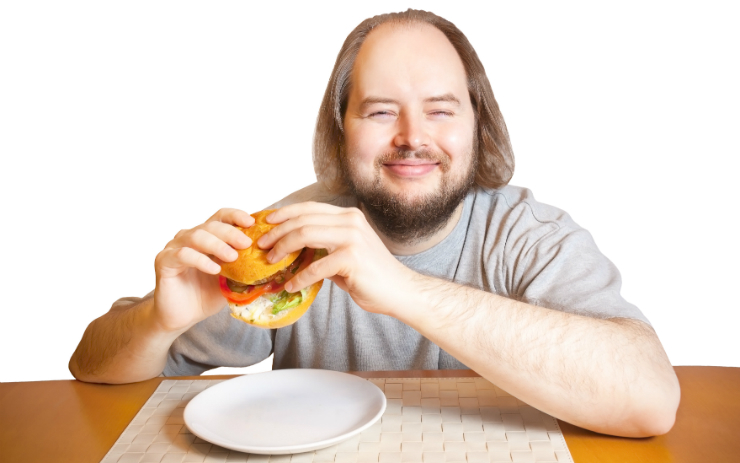 Do you believe overeating fast food qualifies as an addiction, or is it just a bad habit? Please opine in the comment section below.